Sometimes, we just have to get things in perspective. Think about it - we've all got problems, not enough money, we don't feel well, it's too hot, too cold, too much rain. 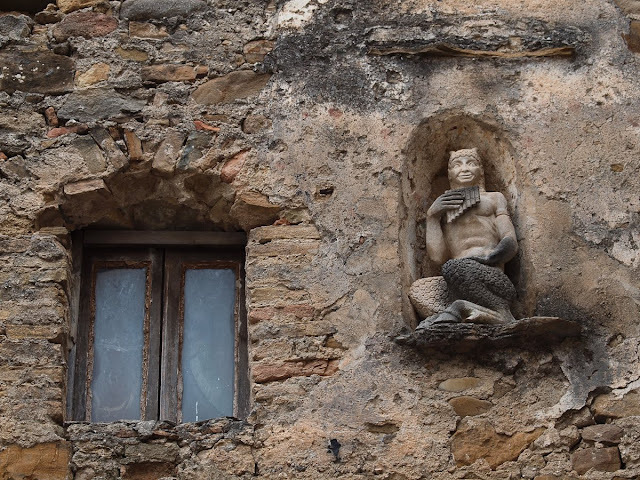 Then - think about this satyr - stuck in a niche in a village destroyed by an earthquake in 1887. All he can do is play the pipes of Pan and wish he could get more comfortable. Parfois , nous avons juste à mettre les choses en perspective. Ainsi, nous avons toutes sortes de problèmes , nous n'avons pas assez d'argent, nous ne nous sentons pas bien, il fait trop chaud ,il fait trop froid, il y a trop de pluie.... Alors - pensons à ce satyre - coincé dans une niche dans un village détruit par un séisme en 1887. Tout ce qu'il peut faire c'est de jouer de la flûte de Pan et d'espérer une installation plus confortable. S'il vous plaît cliquer pour voir comment les autres autour du monde ont interprété le thème d'aujourd'hui de «perspective». Oh it's making my legs ache just looking at him stuck in this position Jilly!! You're completely right, when you look at the 'big' picture, things could be worse. Keeping one's perspective is important yet sometimes it is SO hard! Fantastic picture! And I'm glad that this little god was kept, through time and events..
Great post on perspective, poor Pan! Wasn't me that told you about the boat wreck at Noosa. I have really enjoyed your ruined village series. Clever. Somehow, I don't think that this niche was made with him in mind. Glad you liked my dog photo yesterday. I thought you would. I love this perfectly composed image, it is something unusual and strange, even mysterious. he does look stiff, poor pan. Always good to be reminded of this ... Pan has been around a while I guess. A clever interpretation, Jilly. I guess I do have it better than that guy. He's great! Devilish. I wonder if he pushed out a saint statue that might have 'lived' there before he usurped the seat. Ooh, there's a story here . . .what's behind the window? Why is pan crouched like that? What's about to happen? Now that does put matters in perspective. Great image and theme day words.